Edit: I accidentally deleted the photos linked to this post. Sorry! I'm in week two of my marathon training (week three of Hal Higdon's novice 2 program), and it's getting seriously toasty in the Chicagoland area. We had a heat wave and temps reached close to 100, and it's not even technically summer yet. While it will get cooler this week, summer is here to stay. I had to tackle my first long run on Sunday, and it was 89 degrees by the time I finished ... at 9:20 a.m. In fact, my phone's weather app had a cactus in the icon for that day's weather. It was a novelty. Get up early. It might be steamy even in the early a.m., but at least the sun isn't beating down on you. Pick your route carefully. Find a forest preserve with some tree cover for shade, or at least run on the side of the street with the most shade (running in the morning makes this easier). Hydrate well before running. You need fluids to be able to sweat and regulate your body temp. Carefully consider your clothing. Less is more, but add a visor and sunglasses to deflect some rays. Also, light colors are better than dark colors. Carry water. 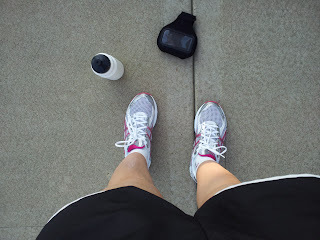 It doesn't matter if you're planning a practice half marathon or a quick 5K, take a water bottle when it gets hotter. You don't want to find out when you're a mile away from home that you're thirsty. Plus, it's nice to douse yourself with something when it gets really steamy. Re-hydrate after running. Replace everything you've lost and use a cold water or sports drink to cool yourself off. While this isn't related to keeping cool, wear sunscreen, please. You should be wearing at least an SPF 15 every day, but bump that up to at least SPF 30 during the summer. Look for waterproof or sports-specific blends to prevent yourself from sweating it off. Apply before donning your running apparel and at least 30 minutes before your workout. Of course, if all else fails, there's always the treadmill, but then you have to worry about passing out from boredom instead of dehydration. I made the questionable decision to run at lunch today. Thank goodness for water fountains on the lakefront path! Also, I find that sometimes just slowing down in the heat is the best way to survive. Think of it as time on your feet instead of striving for pace.